Anne Frank, a young girl who was raised during very difficult times once said, "the best remedy for those who are afraid, lonely or unhappy is to go outside, somewhere where they can be quiet, alone with the heavens, nature and God. Because only then does one feel that all is as it should be"; Anne Frank wrote The Diary of a Young Girl which captured the fear and anticipation her and her family went through. 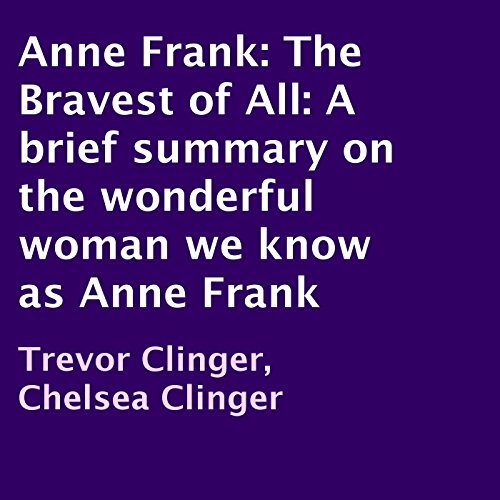 This brief summary of Anne Frank is perfect for quick understanding of Anne Frank and her life. This book contains only the important details one must know about Anne Frank. You want to have a quick overview of who Anne Frank was, and what her life was like, then this is the book for you. Granted, it is brief, but if you have no clue, and need to know about her quickly it will bring you up to speed. It is written well, is concise, and as detailed as you could be for the amount of time that it is. Zens narrates, and is easy to follow and understand. Even though I did receive a promo code for this review it in no way influenced my considerations of the material, and in fact, inspired me to be more honest. In fact, getting a code generally makes me harsher as a reviewer as I am more often concerned what someone like Me will decide based on my review.